As it is well known to the scholars of ancient Albania, the history of Italian research in Northern Epirus is well established and began at least at the end of 1920s, with the Italian Archaeological Missions of Luigi Maria Ugolini, who worked in Phoinike first and then moved to Butrint. Thanks to this excavation, many of the monuments still visible in the current Butrint archaeological parc were brought to light . The new project has its origins on the consolidated collaboration of Albanian and Italian researchers who have already matured extensive experience in the study of Phoinike and its territory. Moreover, this working group is very sensible of the important responsibilities towards this exceptional archaeological site. This is why we intend to commit ourselves to documentation and conservation, even before revealing new archaeological contexts. In the fall of 2015 and 2016, the first two Campaigns of Archaeological Research and Topographic Documentation of the joint project between University of Bologna and Institute of Archaeology of Tirana were carried out in Butrint, in agreement with the colleagues of the Butrint National Park. 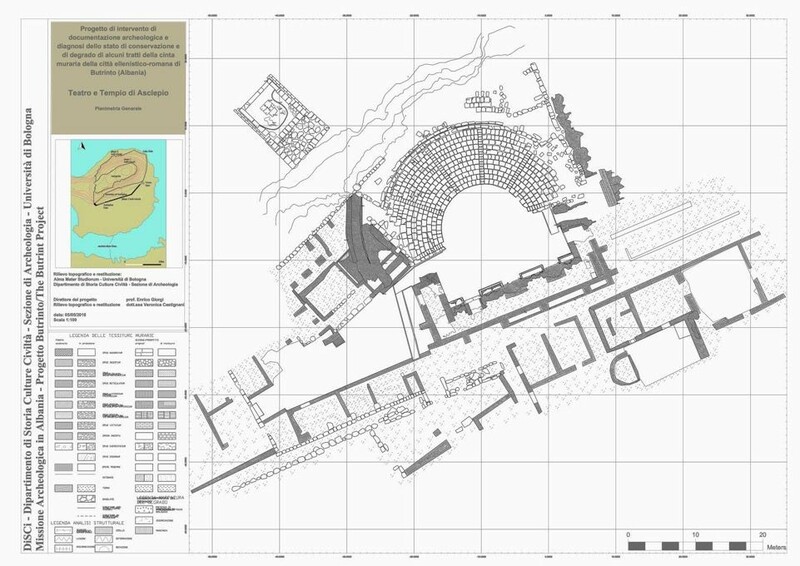 The aim of this research programme was to resume the study and documentation of some important urban contexts such as the area of the Sanctuary of Asclepius, particularly of the Temple on the upper terrace, and of the fortification system surrounding the Acropolis. This objective has been pursued not only in order to improve the understanding and documentation of structures with modern methods, but also with to the idea of assessing possible problems of deterioration that could compromise the future conservation of these important monuments of Albanian archaeology, in a site considered a World Heritage by UNESCO. The Butrint Project, coordinated by Belisa Muka (Institute of Archaeology of Tirana) and Enrico Giorgi (University of Bologna), in agreement with the Butrint National Park, is part of the broader program of Italian-Albanian archaeological research in ancient Caonia, an Epirus region corresponding to present southern Albania, directed by Sandro De Maria and Shpresa Gjongecaj. Since 2017 the project has been part of the activities of the Archaeological Mission of the University of Bologna in Butrint, and is financially supported by the Ministry for Foreign Affairs of the Italian Republic . Critical review of previous bibliographic and archival studies and photographing of the entire wall circuit with particular attention to the problems of degradation. Topographic survey with Laser scanner and mapping of the deterioration of the walls (from 2016 and still in progress). 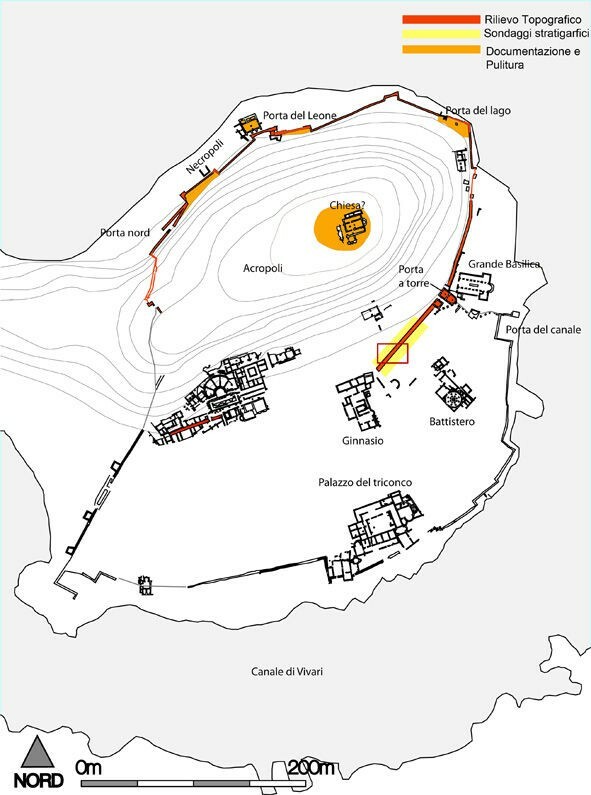 After an initial GPS survey, the survey of the structures was carried out using the Laser Scanner methodology, using instruments and operating practices suited to the architectural documentation of the Cultural Heritage that have been already tested during other important projects of the University of Bologna such as the Plan of Knowledge of Pompeii (Fig. 1, Fig. 2). 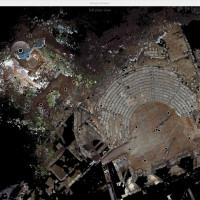 The area of the Sanctuary of Asclepius and the terrace above it was detected with a Faro 3D Cam2 Laser Scanner equipped with a high resolution ISTAR Fusion HDR spherical chamber. 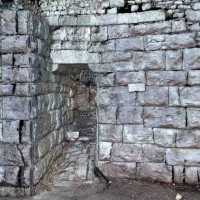 The walls between the Lake Gate, the Lion Gate and the North Gate were subject of a survey conducted with the Leica P30 Laser Scanner at flight time (TOF, time of flight). 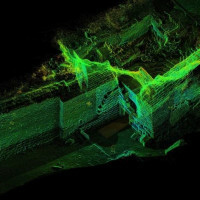 In particular, this laser scanner uses a hybrid technology called Waveform Digitizing (WFD), which allows density, precision and acquisition resolution to be maintained in a cloud of extremely high points over the entire range of measurements performed. Moreover, the possibility of having a high precision biaxial compensator allows for better quality scans to be produced. The texturing of the points took place through the internal chamber of the laser scanner or in association with the NcTech ISTAR spherical chamber to obtain a better colour balance of the photographic sockets (Fig. 1, Fig. 2, Fig. 3, Fig. 4, Fig. 5, Fig. 6, Fig. 7, Fig. 8). 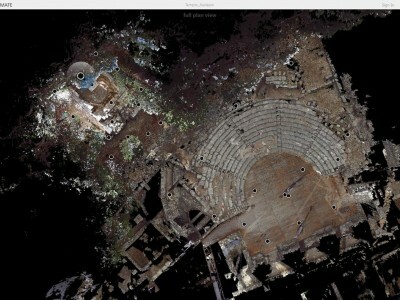 The 2015 campaign had as its main objective the topographic documentation of the temple placed on the terrace that dominates the Theatre from the point of view of its more careful archaeological reconsideration (Fig. 9). As is well known, the building was brought to light in the final stages of the research directed by Luigi Maria Ugolini and very little has been communicated so far to the scientific community, apart from a few brief considerations in the volume published in 1937. In that publication the structure of the building is dated to the Hellenistic era with a remake of the floor in Roman times, without mentioning the presence of an emblem. On that occasion Dario Roversi Monaco made a drawing of the building, as evidenced by a measured sketch that nevertheless remained unpublished. This news was subsequently taken up by the scholars until the recent study on the entire Sanctuary led by Milena Melfi, who attributes the Temple to the cult of Asclepius. More recently, a study has been presented by Zamir Marika and Enkeleda Nesturi concerning the mosaic preserved inside the Temple . From this latest work we learn that in the 1980s restoration work was carried out and on that occasion a mosaic emblem was brought to light depicting a polychrome snake, an animal traditionally associated with Asclepius. This representation, which is a fundamental clue to the attribution of the cult, was torn away and transported to Tirana, where it is still preserved. Finally, more recently, there have been some cleaning and consolidation intervention promoted by the Butrint Foundation. The scarce data justifies the need to resume the documentation, analysis and interpretation of the building, in order to better understand its architectural development and its relationship with the surrounding urban context. 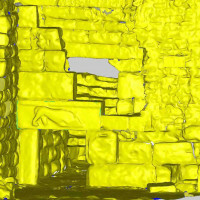 At the present state of research, we can only assume that the Temple was supposed to be a tetrastyle prostyle building of which remains only the foundation. 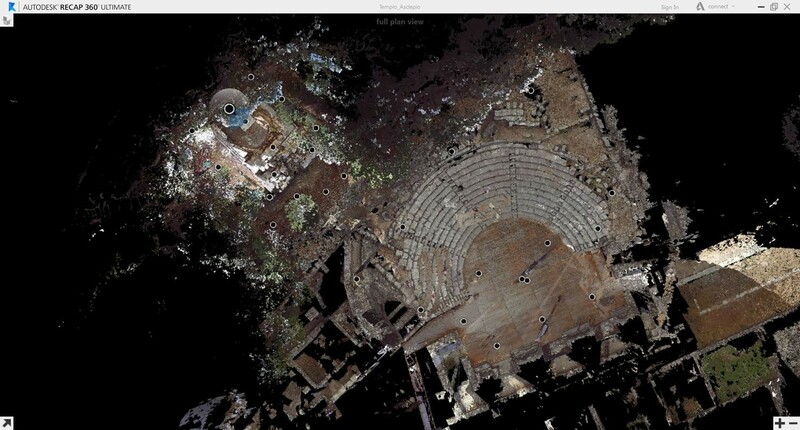 It stood on a mighty terracing overlooking the Theatre and probably had to be accessible from the east. The terracing was obtained by regularizing the outcropping rock and it is supported by a containment wall in pseudo-isodomic masonry. In the back part, the rock wall has been carved in order to obtain the necessary space for the construction of the rear part of the cell. The rear part of the euthynteria (with the blocks equipped with the characteristic tenons for the installation), of the crepidoma and the stylobate, as well as part of the cell, are also still intact. The latter is bounded by perimeter walls in a square, intact for a row on the sides and at most for three rows on the back wall and in some points tied with dovetail grappas. The floor, with at least two different building phases, as well as the base of the cult statue has large sections which are still intact. Just in front of the base there is a rectangular gap caused by the removal of the emblem with the representation of the snake, currently stored in Tirana (E.G.). 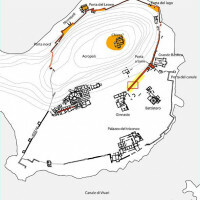 In 2016 a preliminary survey of the wall circuit was carried out, starting from the oldest remains, preserved on the eastern edge of the highest part of the acropolis, and descending around the hill towards the West, North, Lion, Lake or Scea Gates, the Towers and the sanctuary of Asclepius with the relative sections of intermediate walls. The main purpose of this activity was to lay the foundations for the continuation of the topographic survey and to set up a more analytical project to map the deterioration and static risks. 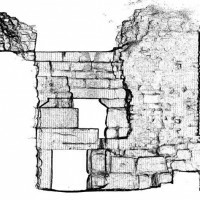 At the same time, this task was also useful for a revision of the interpretation of the various building phases of the Walls, even on the most strictly archaeological level. In this sense, particular attention has been paid to the Hellenistic phases, but the other phases of the Roman and medieval age have not been underestimated either. Finally targeted investigation was also carried out on the acropolis, to verify the conservation status of the sections of walls in polygonal masonry already identified in this area. The starting point of this work was, of course, reconsidering the fundamental studies already available for the Butrint Walls, with particular reference to the recent contributions of 2013 by Richard Hodges, Simon Greenslad, Sarah Leppard and Matthew Longue, and 2009 by Gjerak Karaiskaj . 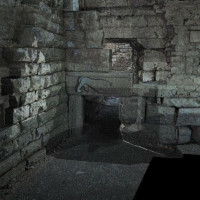 Moreover, when it comes to conservation problems, discussions with the Park’s archaeologists were fundamental, as they had already carried out a preliminary survey indicating and documenting the most significant emergencies. In this sense, we should underline the fact that the attention to conservation problems of Butrint has never been neglected by our Albanian colleagues and some problems have already been appropriately addressed in the past and more recently in a seismic risk assessment project . On this basis it was decided to undertake two preliminary stratigraphic surveys in the section of double-walled walls that run between the area of the Forum, recently investigated by the American mission, and the Tower Gate. This area has already been partially excavated by Albanian archaeologists. The long trench dug through the woods to bring to light the layout of the walls was the work of Dhimosten Budina in the 1970s. 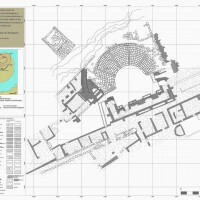 According to archival data, it appears that the excavations were only carried out in the southernmost (south-west) sector, near the so-called Gymnasium already excavated by the Italian mission of the 1930s and 1940s. Subsequently, in the 80s, part of the area located inside the walls just west of the Tower Gate was excavated. Mainly late structures, built in support of the western front of the walls for a depth of about two meters from the crest, were brought to light. Currently the walls in this area run inside the forest, outside the park’s visitors’ itinerary. Thus, the possibility of investigating the building technique was presented, emptying the filling (emplekton) still present in various sections inside the double external curtain. As established with our Park colleagues, after the excavation the area was back filled and restored to the same state it was in before the excavation (Fig. 10). 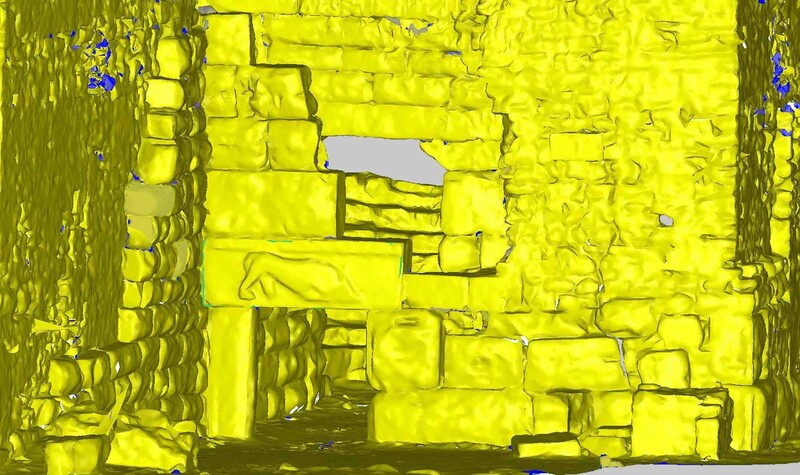 The stratigraphic survey made it possible to clarify that the external curtain walls, in ‘pseudo-isodomic trapezoidal masonry, are connected at fairly regular distances from walls in newly-sketched stone blocks, in order to create stone-filled chambers. In this area the walls seem to have been partially shaved in the past, when they were bypassed and probably incorporated by the buildings of the Roman city which had expanded beyond the limit of the Hellenistic walls. The first excavation campaign of 2018, which essentially can be credited with having reopened the issue, has been limited to a specific sector and flanked by a topographic survey work still ongoing, and which has already yielded important elements for the analysis of the techniques and phases. The first two targeted trench excavations in the section of walls to the west of the Tower Gate, have clarified the phases of reuse of the city walls and the expansion of the city back to the Hellenistic era. In particular, in the fifth compartment from the Tower Gate, the excavation has gone 3 meters deep, to the surface of the water and has allowed a few ceramic fragments and several remains of animal bones still under study to be recovered. Some alterations of the late Roman age have also come to light. The excavation was extended to the west also to the next compartment. In the early Middle Ages, it seems that, throughout this area, on the remains of the shaved walls, a tread floor made of bricks and tiles was set up, cut from an inhumation tomb. This open area gave access to a building whose façade was set on the innermost Hellenistic wall curtain. 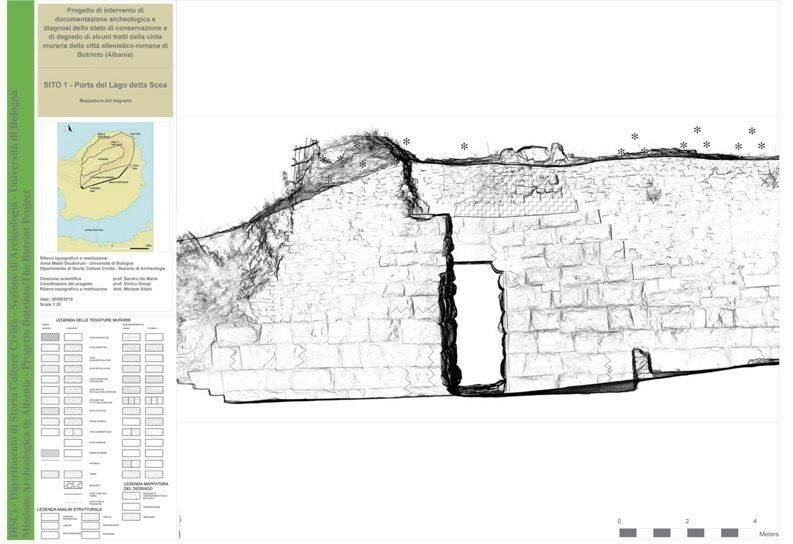 The resumption of research along the walls of Butrint opens a new important chapter that we hope will contribute to the understanding of this important work of fortification. As is well known, in fact, the study of Hellenistic fortifications in Caonia is often based on the method of comparison between the various building techniques and only rarely, as for example in the cases of Phoinike and Ripes, on archaeological considerations based on precise stratigraphic findings. Often the walls of Butrint, among the best ones preserved in the region, represent a constant subject of comparison. For this reason, we believe that the newly undertaken stratigraphic survey campaign will continue in order to give useful results in understanding the chronology of the complex and the various building phases (B.M.). De Maria, Sandro. 2003-2004. “Léon Rey, Luigi Ugolini e le origini dell’archeologia albanese”. Iliria XXXI: 83-104. De Maria, Sandro. 2007. “Butrinto e Fenice a confronto”, in Roman Butrint. An Assetsment edited by Inge Lyse Hansen and Richard Hodges. Oxford: Oxbow Books, 175-188. De Maria, Sandro. (ed.) 2012. Le ricerche delle Missioni Archeologiche in Albania nella ricorrenza dei dieci anni di scavi dell’Università di Bologna a Phoinike (2000-2010), Bologna. Giorgi, Enrico, Belisa Muka and Michele Silani, “Butrinto: il mito di Enea e l’archeologia italiana” in Forma Urbis 23, 1: 20-27. Greenslad, Leppard, Longue 2013. “The acropoli of Butrint reassested”, in Butrint 4. The Archaeology and Histories of an Ionian Town edited by Inge Lyse Hansen, Richard Hodges and Sarah Leppard, Oxford: Oxbow Books, 47-76. Hodges, Richard. 2013. “Excavating away the ‘poison’: the topographic history of Butrint, ancient Bouthrotum”, in Butrint 4. The Archaeology and Histories of an Ionian Town edited by Inge Lyse Hansen, Richard Hodges and Sarah Leppard, Oxford: Oxbow Books, 1-21. Karaiskaj, G. 2009. The Fortifications of Butrint, Oxford. Melfi, Milena. 2007. 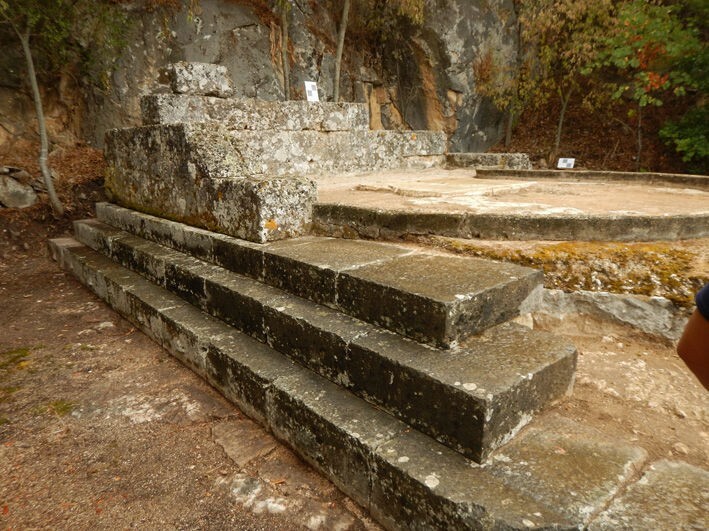 “The sanctuary of Asclepius” in Roman Butrint. An Assetsment edited by Inge Lyse Hansen and Richard Hodges. Oxford: Oxbow Books, 17-32. Marika, Z and E. Nesturi. 2015. “Arti muziv dhe mozaiku i Asklepit – Butrint. Personifikimi dhe miti i gjarprit (Asklepios) në Iliri dhe Epir”. Monumentet: 135-144. Giorgi, Enrico and Belisa Muka. 2015. “Le nuove ricerche della collaborazione Italo Albanese a Butrinto”, in New Archaeological Discoveries in the Albanian Regions, Tirane: Botimet Arkeologjike, 339-336. Ugolini, Luigi Maria. 1937. Butrinto. Il mito di Enea. Gli scavi, Roma: Istituto grafico tiberino. Zheku, K. 1971. 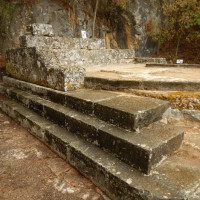 “Restaurimi i Portes së Luanit-Butrint”. Monumentet: 79-86. 1. Ugolini 1937; De Maria 2003-2004 ; De Maria 2007; De Maria 2012. 2. Giorgi, Muka, Silani 2018. 3. Melfi 2007; Marika, Nesturi 2015. 4. Greenslad, Leppard, Longue 2013; Hodges 2013; Karaiskaj 2009. 5. Zheku 1971; Muka, Giorgi 2015. 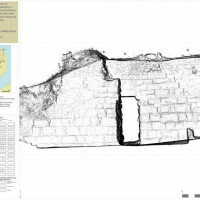 Belisa Muka, Enrico Giorgi 2018, ‘The new Italian and Albanian archaeological project in Butrint (2015-2018)’, in Groma 3. doi: 10.12977/groma15.